"We have been waiting for this for a long time and we are glad to see so many H&M fans in Banja Luka!" The first H&M store in Bosnia and Herzegovina finally opened in Banja Luka! H&M welcomed the customers to the store in Banja Luka’s new mall Delta Planet shopping. Around 1000 enthusiastic customers were lined up for the opening and the first fans waited from the early morning to be the first in the country to grab their favorite pieces from the H&M collections. All the customers received a 20% discount on the total purchase they made on the opening day, and the first customers received gift cards. The hype outside the store began after noon when H&M handed out queuing bracelets to excited fans. The first in line received a gift card in the amount of 200 KM, the second 150 KM, and the third 100 KM. The next 1,000 customers were awarded with a 20 KM gift card. “We have been waiting for this for a long time and we are glad to see so many H&M fans in Banja Luka! I am very proud to welcome customers to our first store in BiH, where our customers can find fashion and quality at the best price in a sustainable way. I’m excited to see the reactions of our fashion from of our new fans in BiH” said Claudia Oszwald, country manager"
The store in Banja Luka stretches to 2,500 square meters, divided on to two floors, providing all new H&M customers in Banja Luka a unique and exciting shopping experience. Among other spring collections customers in the first H&M store in BiH could find a campaign with denim and fashion products in different of shades blue. 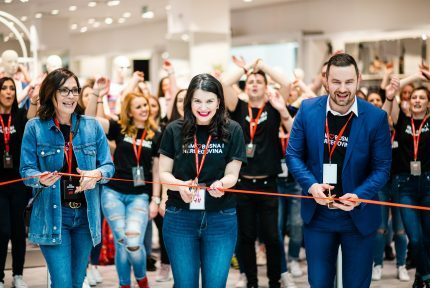 The country manager of H&M for Austria, Slovenia, Croatia, Serbia, Georgia and Bosnia and Herzegovina Claudia Oszwald cut the red ribbon together with her team and greeted the first eager customers.